The land of Kerala is full of colourful events and festivals which not only celebrate the customs and traditions but also pays a tribute to the very spirit of the people that makes them an extremely special lot. These festivals are a pleasant break from the day to day life of the natives. And, for tourists coming to the state, it is yet another opportunity to understand the deep rooted faith of the people and participate in their festivities. Vishu is a festival held in the state of Kerala (and adjoining areas of Karnataka and Tamil Nadu) in India around the first day in the Malayalam month of Medam (April - May). This occasion signifies the Sun's transit to the zodiac Mesha Mesha Raasi as per Indian astrological calculations. Vishu is also considered as the Malayalam New Year day and thus the importance of this day to all Malayalees regardless of their religion or sect. Onam is an annual harvest festival, celebrated mainly in the Indian state of Kerala. It is the foremost festival among the cultural repertoire of Malayalees, and falls during the month of Chingam (August-September as per the Gregorian calendar), the first month of the Malayalam calendar and lasts for ten days. Though it is essentially a harvest festival of Malayalees, mythologically it is linked to Malayalee-Hindu folktales. Like many other religious festivals in India, Onam is celebrated by people across all castes and faiths. Deepavali or Diwali as it is popularly called, literally translates as the festival of lights. It is celebrated to commemorate the victory of Lord Rama over Ravana, and that of the victory of good over evil. In Kerala, it is popular among the North Indian communities that live here. Households and courtyards are a brilliant sight with small earthen lamps all over the place. Many tasty sweets are prepared and crackers are fired. Christmas is celebrated splendidly in all parts of the state, especially in central and south Kerala. People are in a merry mood days before 25th -of December. Christmas Star, trees and cards and the crib adorn many homes. In the evenings there would be large processions that visit every home singing carols and spreading the good news and cheer of Christmas. Friends and neighbours are received in Christian homes with cakes and a variety of dainty dishes. The festivities last till the New Year. In some communities, 7th January the old Eastern Orthodox Christmas day marks the culmination of festivities. This is a famous festival celebrated in the month of Kumbam (Feb- Mar) in connection with the Mahasivarathri. The grandiosity of the festival has earned it a place as important as the Kumbamela at Prayag. Special poojas (prayers and offerings) and abhishekams (bathing of the idols) are carried out in the temple to commemorate the day that Lord Shiva consumed the deadly poison to save the world. Various cultural programmes are held in Alwaye, on the banks of the Periyar. People from different parts of the state and belonging to different religions gather here. This is a great and very well known Christian convention. The convention held on the banks of the river Pamba, is attended by almost all categories of Christians in the state and hence speaks of the co-operation and fraternity among different denominations of the Church in Kerala. The convention is usually held in the month of February. The Annual boat races in different parts of the state are brilliant competitions that attract viewers from far and wide. It is also nothing less than a celebration or festival. In every sense they are national aquatic festivals in Kerala, the land of several lakes and backwaters. Decorated boats carrying about 150 oars men and 3-4 helmsmen showcase brilliant performance. The atmosphere echoes with special songs called vanchippattu. Most famous among the races are the ones held at Aranmula, Champakkulam and the Nehru Trophy boat race at Alappuzha. Boat races at Thalavady in Alappuzha, Kumarakom, Mannar, Aranmula and Thiruvandoor near Chengannur are also quite popular. This is the famous festival of martial arts held at Ochira. The event is held in mid June. There is a spectacular display of Kerala' s very own martial art, kalarippayattu. Equally famous is another martial arts festival that is celebrated in November/December for about twelve days. The celebrations are called Panthrandu Vilakku (twelve lamp festival). Women folk render special songs, dance performances (Thiruvathirakkali and Kolkkali), Oonjalattom, swinging on an oonjal (swing). They also observe special diet and keep vigil through the night for Siva. A festival exclusively for womenfolk, there is hardly any festival like this observed in the India society. Sivagiri mutt is one of the famous pilgrim spots for those who believe in and follow Sree Narayana Guru, the saintly and scholarly social reformer. Sree Narayana Jayanthi celebrated in August every year commemorates the Guru's birthday. Colourful processions, seminars, public meetings, cultural shows, community feasts and special rituals make the day an eventful one. Seminars and discussions on various themes are also held. The Samadhi day of the Guru is observed in September with prayers and memorial lectures. Kaladi is the birthplace of another philosopher-saint of Kerala, Sri Adi Sankaracharya. It has now become an important pilgrim centre that attracts a lot of visitors, especially during the 5 day (April/May) celebration, Sankara Jayanthi, held to mark his birthday. The day is marked by grand celebration including several religious rites. The village fair held from 14 to 23 January every year features recreated traditional houses, attire, food, crafts, etc. This is one of the most popular dance festivals of the state. Talented and graceful dancers from all over Kerala and even outside the state, gather at Kanakakunnu Palace grounds to showcase a week of fabulous performance. The open-air theatre here bears witness to this brilliant show every year. Even renowned dancers consider it an honour to be able to perform at the NIshagandhi festival. Fabulous shows of Bharathanatyam, Mohiniyattam, Kathak, Odissi, modern ballet and other folk genre are presented here. 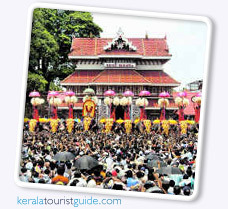 This is a famous dance and music festival held at Thiruvananthapuram. It is called the Navarathri Mandapam Concert series. The festival lasts for 9 days, with the grand finale on the Mahanavami day. The festival is for artists to pay respect to Goddess Saraswathi (the deity of all learning and the arts), Lakshmi (the Goddess of wealth) and Durga (the embodiment of courage and power).